An RCA to HDMI converter box that can convert an analog input to HDMI output. 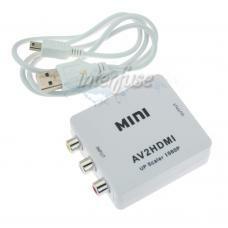 The converter box does not work to convert HDMI to RCA, please check our store if you need an HDMI to RCA converter. The converter box will upscale video signal from DVD input source to HDMI output and supports resolution up to 1080P.